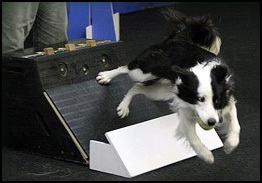 — Kennels Clubs, Obedience Clubs, Agility Clubs, Schutzhund Clubs, and more. NOTE: Breed Specific Clubs are listed under the individual Breed Listings on the Canada’s Guide to Dogs website. — If you would like to get involved in an activity with your dog or are simply interested in learning more about a particular sport or activity, this section — Sports & Activities — provides information, descriptions and details about each sport/activity listed along with various articles on the subjects. — If the sport or activity you are looking for is not listed in this section, see the Working Dogs Section which covers some of the jobs that dogs are involved in. These include: Guide Dogs, Service Dogs, Therapy Dogs, Police Dogs, Detection Dogs, Search and Rescue Dogs, and much more. Also see the Dog Training Section for training information and listings of Training Centres across Canada. — Ever wonder what all those letters stand for?… An alphabetical table of the terms used for performance titles. — Listing of parks across Canada where you can take your dog. Founded in 1999, the organization’s primary mandate was to promote and maintain off leash privileges in Ottawa, Ontario. Successful in securing a larger and greater number of dog friendly areas, RDOC has turned its center of attention to the promotion of responsible dog ownership through education. The focal point now for the group is developing and hosting educational programs and workshops like the Dog Owner Training School (D.O.T.S. ), DOG-ED, Canadian Canine Good Citizenship Test™ (CCGC™) and a Dog Bite Prevention Program. Through education, RDOC’s goal is to build and support a network of responsible dog owners, raise awareness of dog behaviour and facilitate the restoration and preservation of a dog-friendly society.